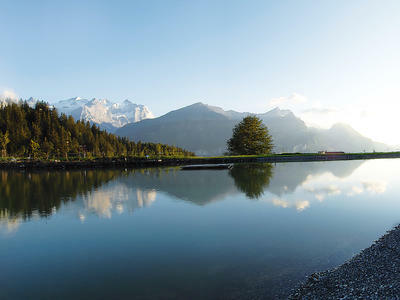 The new, man-made bathing lake on the Hasliberg in the Bernese Oberland has already become the place to meet for guests and locals alike. What better way to enjoy a warm, summer day in the mountains than relaxing by a lake and taking in the magnificent view. The bathing lake is 3000m2 and is situated between the bottom cable car station at Twing and the REKA holiday village on the Hasliberg. There is a shallow area for kids and a lawn to sunbathe on. A kiosk with bistro, beach baskets, changing rooms, an outdoor shower and of course a sandy beach with panoramic views make up the infrastructure in this unique alpine bathing experience.